Jyoti Basu who straddled W. Bengal and Indian politics for well over three decades and had a record setting innings of 23 years on the trot as the Chief Minister of the state died in January 2010 after a drawn out illness. Since his death, there has been a veritable flood of obituaries, critical commentaries and tributes ranging from the insightful to the superficial and even the patently concocted ones. Very few, if any of the pieces have dissected in some detail the political and economic realities of his era. This piece is an attempt to factually and objectively look at the political and economic fallouts in W. Bengal owing to Basu’s reign and document the three decades of political dominance by the Indian communists in that eastern Indian state. Basu knew the blame-game pretty well and played it often, blaming in turns wealthy landowners, industrialists, the unhelpful attitude of the Central govt. towards the State and even the British for all the problems of the state and for the series of failed initiatives which he kept piling up fairly rapidly. 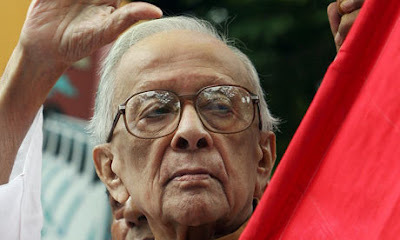 It is ironic that for a good part of his reign he survived and thrived with the aid of tacit or implicit support from the Congress at the Centre, which seized on the CPM as the next best proxy they could have for the state of W. Bengal since their local party organization was in shambles and in no shape to win elections. His long innings as the Chief Minister of W. Bengal and the monarch of all that he surveyed in the State was also bolstered by the risk-averse and status-quo loving nature of the average denizen of the State. After a brief dalliance with the Congress with Siddhartha Shankar Ray as its nominated Chief Minister, the average Bengali ran for cover when S.S. Ray and his administration failed to live up to their expectations. S.S. Ray got too busy trying to consolidate his power base with Mrs. Indira Gandhi and helping her to formulate the 'statutes' of the 'Emergency' which she imposed in 1975. Day-to-day affairs were left in the hands of mostly inexperienced, inept, corrupt and boorish ministers and Congress party functionaries. 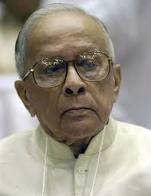 Since Jyoti Basu's party had already infiltrated and consolidated their hold on many village 'panchayats' (local self -government) and virtually all trade unions, S.S. Ray and his ministry were fairly powerless to stop the turmoil and chaos which was let loose by these bodies on a regular basis. 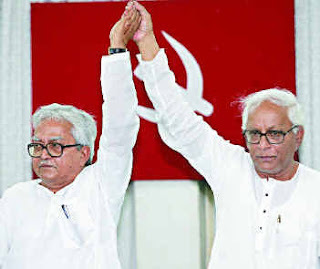 Besides, during the early part of his administration, he had his hands full finishing off ruthlessly the job that had been somewhat ham-handedly started several years earlier by the United Front (whose major constituent was Basu’s party, the CPM). I am referring to the task of taming and when that failed, incarcerating, torturing and generally breaking the backs of the Naxalites. Ironically, some years earlier, the founders of the Naxalite movement were an integral part of the undivided Communist Party of India (CPI). 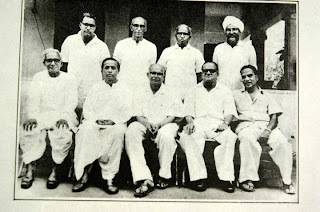 In the mid sixties Basu and some other prominent leaders broke away from the CPI and formed the CPI-M. The Naxalites broke away too and started banding together around the same time. Among all the radical thoughts and extreme measures that they believed in and espoused, decimation of the CPM figured quite high up on the list. The Congress in the State, post 1977 when the CPM regained power, was in shambles, riven as it was by factional rivalries, occasional turf-wars among the faction leaders and their followers and saddled with a pretty poor public image. Indira Gandhi was herself fighting for survival at the time since the Janata Dal led Govt. had seized power at the Centre and was threatening to make her pay for her sins of omission and commission over the years. Later, when she came back to power in the eighties, she seemed happy enough to bask in the tacit support of the CPM at the Centre and possibly found the task of setting right the Congress party in W. Bengal a somewhat uphill and distasteful task that was not worth tackling anyway. And so, aided by a divided and fragmented opposition with a poor public image in the State and the tacit blessings of the Govt. in power at the Centre, Basu and the CPM kept coming up triumphant in successive elections. Manipulating electoral boundaries and rolls, having a good number of party sympathizers and even cadres among the officials who were supposed to oversee the voting process, rigging votes selectively and clinically and issuing unwritten fiats through the omnipresent party apparatus and the panchayats which were mostly controlled by the party, certainly helped. Let's cast a look at what Basu, his party and his toothless coalition partners achieved when they first got hold of the levers of power in 1967. With minor changes, they continued from where they had left off in 1977 when they were swept back to power with even larger majorities than their first innings which commenced in 1967. This has been repeatedly touted as one of the resounding successes of Basu and his years in power. While he and the CPM set out to redress inequities and relieve the misery of the small farmer, it was done without a master plan and in ways which were rather unconstitutional and unfair. Land was forcibly taken away from large landowners without even compensating them at fair market rates for the land they were forced to part with . The land thus acquired was parcelled out among the landless and the small farmer who was till then mostly engaged on a contractual basis by the large and wealthy landowner and farmer to till the land under his control. While this was largely reminiscent of what Mao Tse-Tung (Zedong) had done in China with some variations, during his rise to power, it didn't do much to raise the income levels of the landless and the small farmer in W. Bengal significantly. The land parcels spread out among them were often too small and hence unviable commercially for modern farming methods. No effective financing system for the small farmer was set up in parallel and no micro-credit mechanisms were put in place. Infrastructure for modern farming, either by way of waterways, effective access and drainage systems or farming tools and implements were just not there and not put in place also subsequently. In the absence of mechanization, planned crop cycles and expert guidance on optimum cash crop to food grain ratios, productivity improvements were negligible. There was no forward integration with efficient warehousing and storage facilities and distribution systems which would have ensured a good price for the farmer selling the crops he had produced. While W. Bengal had the potential to become a model for the rest of the country in terms of agricultural systems, production and efficiencies, Punjab remained way ahead in all those respects during most of Basu's years in power mainly because Basu and his cohorts had no clue about how to get the entire mix right. They were also too vainglorious and egocentric to seek expert advice and help in this area or to empower specialists and help them to implement all the elements of an effective agricultural system. The land grab operation or "Operation Barga" as it was called also had a debilitating effect on industrial investment in the State . Classically, many wealthy landowners and farmers in other Indian states invested subsequently in various non-agricultural based businesses and industries in their own state. The 'land reforms' together with the militant trade unionism unleashed on existing industries put paid to that in W. Bengal. The few who were left with investible surpluses and still remained interested in diversifying into manufacturing or various other non-agricultural based businesses, did so in other Indian states which were far more investor friendly and provided better facilitation for setting up businesses and industries as well as better infrastructure. Havoc was wrought in this sector by encouraging militant, irresponsible trade-unionism and unleashing a climate of terror on managements of industries and commercial establishments based in the state. Strikes & 'gheraos' (sit-in strikes barricading the concerned managers and executives, physically preventing them from leaving the workplace or the office premises) became everyday affairs all over the state and managements were often strong-armed or even physically worked over in an effort to get them to agree to the demands of the unions, which eventually mostly came to be controlled by the CPM and some of the other left parties. West Bengal had more than its fair share of sunset industries at the time, many of which badly needed to modernize and restructure to stay viable. Shrinking productivity, hundreds of man-hours lost and unreasonable demands by the unions which just couldn't be met, led to the headlong flight of capital and industries from the state since 1967 when the CPM first came to power as the largest party in a United Front government. In terms of industrialization, W. Bengal which ranked pretty much near the top among the Indian states in the 1950s and first half of the 1960s started sliding steadily south in terms of its comparative ranking from the second half of the sixties. By the mid eighties the state was mostly shunned by any investor or industrialist wanting to set up a new venture or even a manufacturing unit of an existing venture. W. Bengal ceased to be ranked even among the top ten industrialized states in India. The Congress during the interim period of five years that they were in power, since 1972, could do precious little to arrest the slide. The Congress was never a cadre based party and the growing numbers of CPM cadres and the trade-unions which were mostly controlled by them ensured that the mayhem, started in 1967 when they first came to power, continued unabated. Since job generation in almost all sectors was virtually non-existent and net job creation mostly negative, experienced professionals, technocrats and managers ventured out of the state in large numbers in search of suitable employment elsewhere in India or outside the country. The overall state of affairs prompted Rajiv Gandhi to remark during the mid-eighties, soon after becoming Prime Minister, that W. Bengal was a dying state. The statement proved to be politically incorrect and naive, hurt the sentiment of the Bengalis and outraged most residents of the state. As mentioned earlier, precious little was done to improve agricultural infrastructure significantly. It was an even sadder story when it came to rural, urban and industrial infrastructure. There was just no vision, no long-term plan, no priority and no resources made available to take care of creaking infrastructure crying out to be revamped, upgraded or enhanced. While volumes can be written about the pathetic neglect of this sector by Basu and the government that he presided over, let us just say that it was a sad story when it came to roads, transport, healthcare, power, education and public housing. Not only did Basu and his cohorts not plan for or invest in infrastructure, worse still, they did not even maintain in many cases what they had inherited. This was nowhere more evident than in the healthcare and education sectors. Nowhere was the pernicious effect of the CPM's and Basu's brand of communism more evident than in the education sector. Party sympathizers, members and cadres were given clear preference over others when it came to hiring teachers for Govt. run schools. Curricula were tampered with and modern Indian history insidiously retold, glorifying the achievements of the Communists and subtly running down other parties and personalities. Poverty was glorified and the pursuit of wealth and material gains painted as undesirable traits. English, which had been the language of business and commerce across W. Bengal since the time of British rule, was struck off the curricula in govt. run and controlled primary schools . One suspects that this also served the purpose of locking in sections of the indoctrinated new generations in the state since, without any knowledge of English or other Indian languages like Hindi, they had no chance of securing employment in any other state in India. 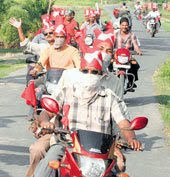 Basu and his party colleagues felt that this was yet another way of perpetuating the party's reign in the state. Interestingly though, children of ministers attended private schools where English was invariably the medium of instruction and many went on to attend universities based outside the state or, in some cases, overseas. Some years ago, in the face of mounting hue and cry from large sections of the local population, English was reintroduced as a subject in govt. administered primary schools. During the fifties, the then Chief Minister of W. Bengal, Dr. B.C. Roy, had set up a modern dairy infrastructure at Kalyani, which is located on the outskirts of Kolkata. It had the essential elements which later could have been integrated backward and forward along the logical supply chain and developed into a success story like AMUL which happened couple of decades later in Gujarat. Basu and his Government did nothing of the kind. Instead, over a period, they laid it waste. There was no effort at developing the service sector as an alternate consequent to the flight of industries. Basu and his colleagues specialized in the smash and grab brand of politics initially and hence listening carefully to different sections of customers and catering to their expressed or incipient needs was not something that they ever either understood or cared for. A typical example was the steady decline of in-country and external tourism in the State. Darjeeling, once considered the doyen of hill resorts in India was left to decay and eventually become a cauldron of agitation and unrest fomented by a local political party which went on to demand secession from the state of W. Bengal. Basu and his cohorts were unable to put out the fire which smoulders to this day. Digha, which had the potential of being developed into a thriving sea resort, remained a rundown one which was not preferred even by the residents of the State for a short and quick getaway. Whole institutions were corrupted and subverted by Basu and his party. Instead of merit and experience, affiliation with and allegiance to the party became the prime drivers for appointments in government bodies and govt. controlled institutions. The State Govt. employees were unionized (no prizes for guessing which party the union owed its allegiance to) as a result of which work culture became pathetic, efficiency and productivity fell to an all-time low and accountability of any kind became non-existent. The law enforcement organization viz., the Kolkata and W. Bengal police was similarly subverted and promotions, transfers and postings were mostly decided on factors other than merit and track record of the individual concerned. Basu's cabinet and inner circle of advisors consisted of people with little idea and experience of what should be the priority areas and the tasks that needed to be focused on. It was an unlikely rag-tag bunch of party apparatchiks, armchair ideologues, sheer opportunists and men and women who had little to commend themselves other than their unfailing loyalty to the man and the party. Basu and many of his cohorts never ever did an honest day's hard work to earn a living. The son of a wealthy doctor who failed the Indian Civil Service qualifying exams for which he had been sent to London by his parents initially, after schooling in one of the best schools of Calcutta at that time, he attended a smattering of courses at the University College London and a couple of courses at the LSE which primarily included Law(It is amusing to see the efforts of certain mainstream journalists, actively aided and abetted no doubt by some of his old party colleagues, to project that he graduated from the LSE, implying by a process of association that he was also an economist when nothing could be further from the truth). Subsequently, like most of his contemporaries who could afford staying and studying in the U.K. at that time, he ended up becoming a barrister. On his return to India and for over two decades and more till he became the 'de-facto' CM of W. Bengal in 1967, Basu remained a 'briefless' barrister and never took up any legal brief or did any other work to earn a living. Consequently when he first became the Deputy Chief Minister after his party came to power in 1967, he had no work experience, no administrative or operational experience and worse still neither the necessary background nor the vision to chart out where he wanted W. Bengal and the people of W. Bengal to get to, in the years ahead (Contrast that with Dr. B.C. Roy if you will, who was a visionary). Basu remained a senior party apparatchik who was as mixed up as his cohorts in trying to transplant and implement wholesale, without virtually any local customization, an ideology and philosophy which was hatched in a foreign land during a different period of history and thoroughly discredited subsequently. One could hardly expect anything better from him than the utter mess he managed to create in a reasonably short period of time, eventually. Basu and his cohorts in the party managed to subvert the Bengali mindset during their three decades in power. The average middle-class Bengali was psyched into becoming a creature who had a perpetually negative mindset and who learnt to drown his ambitions for material gains and a better quality of life and plod on as best as he could. The road to lucre and power for many lay in becoming a party cadre, a functionary or an opportunistic apparatchik. Virtually every institution was defiled, infiltrated and finally taken control of by the minions and sycophants of the party. If anything, these are the lasting and extremely damaging legacies that he and his cohorts have left behind. W. Bengal and Kolkata today is crying out for an Obama like figure who can instil hope, a positive mindset, self-confidence and a belief in 'Change We Need' and 'Change the people of W. Bengal can believe in'. One hopes that the winds of change will gain strength and sweep the state soon.